When we’re not in hunting season we love to go fishing. Yesterday I went out to the Pensacola Bay pass to try my luck and caught this monster of a redfish. They have to be between 18-27 inches to keep but this one measured 43″! Biggest one I’ve ever caught. But he got to live to see another day. Man, that was a fight. We were actually fishing on light tackle for sheepshead during their annual run but the bite turned off just about the time we got on location. 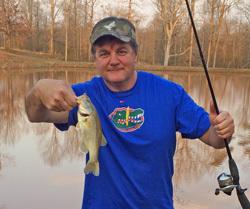 I thought I’d add a little contrast here since Paul texted me this photo of the first bass he caught in his pond. At least Paul could keep and eat his. I took my wife Cindy to supper after our outing with Capt. 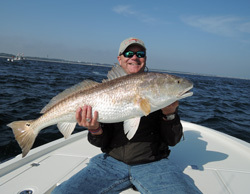 John Rivers, Mega-Bite Inshore Charters, to supper and ordered some very good OssoBuco. That filled me up good. Spring is finally here and that means the fishing is going to heat up. Gary and I are taking a group on a party boat out of Jacksonville, FL in a couple weeks. Hoping the weather is good and the fishing is fine. But even a bad day on the water beats . . .
To quote one of my favorite actors, All right, All right, All right. It’s a new year and new prospects for the Crystal Pig Hunt Club. Like everywhere, it has been a tough winter. But progress is being made. Pines are being planted on the property and soon we’ll be back out there working on our dove and deer plots. 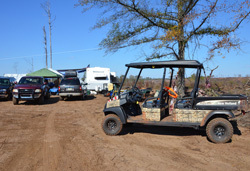 We’ve got planting and fertilizing to do along with moving our RV and putting finishing touches to the main camp area. I don’t think we’re going to be on site for spring turkey which starts very soon but I’m not ruling it out. We’re checking calendars and plotting strategy. For Gary and myself, this is our busiest time of the year for work with all the agricultural meetings and shows. But spring planting is right around the corner and that means time to get in the field. We’ll be keeping you updated from camp and with more information we think you’ll be interested in knowing in the meantime. Need a good jump start to your work week or hunt? Here’s a fantastic looking way to start that I just found out about. We love Tony Chachere’s spices which work with all kinds of hunt meats and dishes. This one is all about bacon (vitamin B). We love to throw in everything but the kitchen sink (just to put it over the top), so we use long skewers for holding all the extra goodies. Along with the slice of bacon, you gotta have celery, stuffed olives, spicy green beans, cherry tomatoes, and baby spicy pickles….But it’s your Mary, so dress ‘er up as you like!